A unique and moving tribute to one of the everyday heroes of World War II, the Otto Weidt Museum tells the story of the site's history as Weidt's Workshop for the Blind. Visually impaired himself, Weidt owned and ran a factory in this space, producing brooms and brushes during the war and employing about 30 blind and deaf Jews between the years of 1941 and 1943. Weidt went to great lengths to keep his employees safe from persecution, even finding places for some to hide, falsifying documents, helping them escape from assembly camps by bribing the Gestapo to have his workers released. Today, the museum is devoted to telling compelling Weidt's story with letters, poems and photographs displayed alongside the personal stories of his former employees. The workshop is mostly in the same state it was in during the war, allowing travelers to get an authentic look at the conditions where employees worked and where one family hid behind a backless cupboard in the space. The Otto Weidt Museum is located in central Berlin at Rosenthaler Strasse 39, about a 10-minute walk from Alexanderplatz. Take the S5, S7 or S75 to Hackescher Markt, then take An der Spandauer Brücke to Rosenthaler Strasse. The museum is open daily from 10am to 8pm. Admission is free. Uncover Berlin’s Jewish heritage and culture on this private, 4-hour walking tour. Explore the city’s Jewish quarter with your very own guide, and gain insight into the history of Berlin’s Jewish community, from the 17th century right through to today. Visit key landmarks like the Old Jewish Cemetery, the New Synagogue and Otto Weidt Museum. See, too, the Missing House and Hackesche Höfe and learn about those who once lived there. Develop a greater understanding of Berlin’s Jewish community, both past and present, on this guided, 4-hour, small-group walking tour. Explore Berlin’s former Jewish quarter and learn about the city’s Jewish heritage from the 17th century to today. See landmark sites like the Old Jewish Cemetery, the New Synagogue, the courtyards of Hackesche Höfe and more. 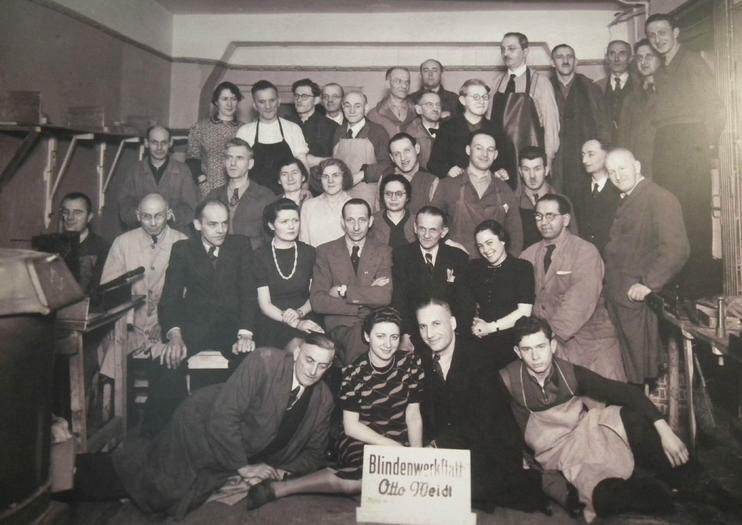 Also, visit the Blindenwerkstatt Otto Weidt, a 1940s-era factory where workshop owner Otto Weidt protected his blind and deaf Jewish workers from persecution during the Holocaust. Join my detailed Jewish Tour and learn about the moving history of the Berlin Jewish community. I am one of the longest working and most experienced jewish Berlin guides. Already in 1987 I came to live as a student at the Alumni of the Film and Television School in the Tel Aviv University. 20 years ago I started living with the Jewish History. I know every street and building in the jewish quarter and I have detailed historical and cultural knowledge for all these topics and many stories about those that lived in Berlin.Itinerary: The Holocaust Memorial, Wilhelmstreet and the Place where the Bunker of Hitler, Memorial to the Burning of the Books, the jewish quarter with the "New Synagogue", Deportation Memorial in the Great Hamburger Strasse, the oldest Jewish Cemetery with Mendelssohn Memorial, Jewish High School, Rosenstarsse Memorial, Deportation Memorial Grunewald Freight Station "Track 17"
For more than 25 years we have been showing important, hidden, and forgotten Third Reich and World War Two sights to guests from all over the world. This tour offers you a unique opportunity to see the heart of the German capital during its most tragic and regrettable moments.With the use of your private air-conditioned vehicle we will be able to take you to sights that many guests don't get to see: from the Olympic Stadium in the West of the city to the Soviet War Memorial in the heart of Berlin's largest park, the Tiergarten. We will show you the Reichstag, where Hitler came to power in 1933, and the site of the bunker, where he took his own life in 1945, just as WWII was coming to an end.Throughout the day you will see memorials for several different victim groups of the Nazi regime, including homosexual, mentally and physically disabled, Jewish, and Sinti and Roma victims, amongst others.At the end of the tour your driver will bring you back to the port of Warnemünde. On this tour we will discover the 800-year history of the Jewish population in Berlin. We'll begin at the former site of the Old Synagogue to discuss the arrival of Jews to Berlin in the medieval period, and then make our way to the neighborhood once known as the Scheunenviertel (“Barn Quarter”). We'll find old traces of the cultural and social institutions that once made this neighborhood the center of Jewish life. We'll see memorials like the "Missing House", the Abandoned Room at Koppenplatz, which serves as a reminder of the Jews taken on Kristallnacht; and some of the city’s 1,400 Stolpersteine (“stumbling blocks”). We'll discuss resistance efforts when we visit the Otto Weidt Museum and Rosenstrasse Memorial. Our walk will finish at a site that emphasizes the complexity of Jewish history in Berlin and the efforts of contemporary German society to find appropriate means of commemoration: the New Synagogue in Oranienburger Strasse, with its beautifully reconstructed golden dome.